DEED TRANSFER –The deed of ownership to the Lincoln Theatre was transferred last Monday, Dec. 31 during a brief ceremony at Attorney Stan Kimble’s office in downtown Limon. 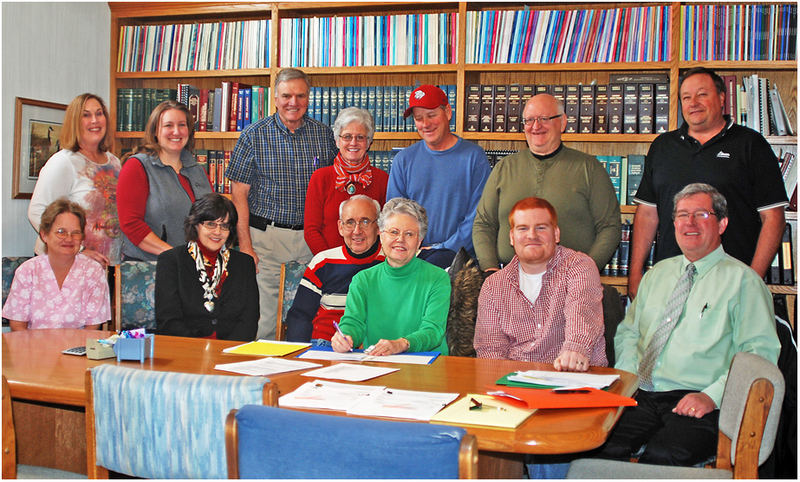 Pictured here (l-r) are: top row – Pat Vice, Lincoln County Economic Development Corporation Inc.; Your Community Foundation board members Cortney Davis, Jim Herron, Linda Hawthorne and Mike Liggett; Joe Kiely, Assistant Town Manager and foundation advisor; Town Manager Dave Stone: bottom row – foundation board members Carla Weeks and Terri Spencer; theatre owners Larry and Marlene Steele; Ryan Kaufman, new theatre operator; and Attorney Stan Kimble. To save the Lincoln Theatre in Limon from permanently closing, its deed of ownership was formally transferred to a local nonprofit organization last week. Larry and Marlene Steele signed over the building’s deed to Your Community Foundation in a ceremony at Attorney Stan Kimble’s office on Monday, Dec. 31. The Steeles have owned and operated the local theatre for the past 28-1/2 years, They donated the theatre to the local nonprofit foundation at no cost. The theatre, which has been in operation since 1938, is temporarily closed at present. The last movie showings under the Steeles’ ownership were held Friday through Sunday, Dec. 28-30. Plans are to reopen the Lincoln Theatre during the third weekend of January. Limon resident Ryan Kaufman has been selected by the Board of Directors of Your Community Foundation as its new operator. After the deed was transferred during December 31 ceremony, Kaufman also signed a lease agreement with the foundation. The Steeles, who owned the Lincoln Theatre since 1984, decided to donate it to the foundation for two reasons. The first reason is they both had reached retirement age. The second reason is that the entire movie industry is converting all of its projection systems from film to digital by the middle of 2013. The Steeles not only handed over the ownership of the theatre building at no charge, but included all of its equipment. After owning and operating the Lincoln Theatre for nearly three decades, the Steeles said they are leaving it with mixed emotions. While they have signed over the deed, the Steeles are not through with the theatre quite yet. Over the next few weeks, they will be assisting Kaufman, the theatre’s new operator. Internet/radio broadcasts, said he is excited to be taking over the operation of the Lincoln Theatre. Kaufman said he plans to work hard to help ensure the future success of the theatre. Kaufman is leasing the Lincoln Theatre from Your Community Foundation, which is its new owner. That local nonprofit organization was formed last year in response to the announcement of the theatre’s closing at the end of 2012. It put together a eight-member Board of Directors, most of whom were present at last week’s ceremony. Kiely said the foundation believes the selection of Kaufman as the theatre’s new operator was a good decision. Your Community Foundation’s work to save the Lincoln Theatre is not over with last week’s signing of the deed transfer and lease. To ensure those contributing to the project receive their tax deductions, Your Community Foundation has partnered with the Lincoln County Economic Development Corporation, Inc., which is already a a 501(c)(3) tax-exempt organization as well as an eligible Enterprise Zone Contribution Project within the East Central Enterprise Zone. Your Community Foundation entered into this partnership because it is a new nonprofit organization that is still waiting for the finalization its 501(c)(3) status from the Internal Revenue Service. Those making contributions to the “Lincoln Theatre Project” will receive both federal and state tax credits. As an Enterprise Zone project, cash contributions are eligible for a state tax credit of 25 percent of the value of the contribution. For example, a $1,000 contribution receives a $250 state tax credit. Any in-kind contributions for an Enterprise Zone project is eligible for a state tax credit of 12.5 percent of the value of the contribution. For example, a $1,000 contribution will receive a $125 state tax credit. State tax credits many be carried forward for a period of up to five years. To make an eligible contribution, an individual or business should write their check payable to “ECCOG” and write a notation on the check to “Lincoln County Economic Development Corporation, Inc. - Lincoln Theater Project.” In addition, the contributor must complete a DR Form 0075, Certification of Qualified Enterprise Zone Contribution. The check and completed DR Form 0075 should then be mailed to: East Central Council of Governments, P.O. Box 28, Stratton, CO 80836. For more information about the contributions, contact Patricia Vice at (719) 775-9070 or Joe Kiely at (719) 775-2346. Do they have collectible posters, film trailers, projectors, accessories, and such that they can sell on eBay to help finance the change to digital?